The Pasadena Roof Orchestra on the bus line '40'! 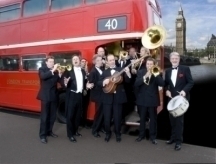 The Orchestra members were really excited about having the chance to shoot pictures on a London ‘Routemaster’ Bus. The Pasadena Roof Orchestra jumped on and off the vintage vehicle. The results can be seen and downloaded on the website’s category ‘press’. The orchestra says thank you to all people involved in this project - great fun and great work!